Located in Jing'an, this hotel is within a 15-minute walk of West Nanjing Road and Jing'an Temple. People's Square and Nanjing Road Shopping District are also within 2 mi (3 km). West Nanjing Road Station is 9 minutes by foot and Jing'an Temple Station is 14 minutes. This smoke-free hotel features self parking, dry cleaning, and laundry facilities. WiFi in public areas is free. Additionally, a 24-hour front desk, express check-in, and free newspapers are onsite. All rooms are individually decorated and feature free WiFi, free wired Internet, and showers. For a bit of entertainment, LCD TVs come with digital channels, and guests will also appreciate thoughtful touches like pillow menus and slippers. Baolong Homelike Hotel Jingan Branch Shanghai features a garden, complimentary newspapers in the lobby, and laundry facilities. Wired and wireless Internet access is complimentary. This business-friendly hotel also offers dry cleaning/laundry services, express check-in, and an elevator (lift). Onsite parking is available (surcharge). 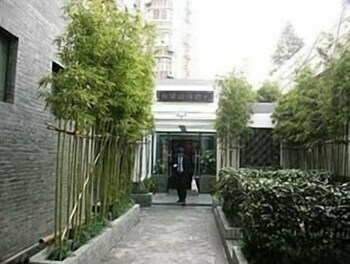 Baolong Homelike Hotel Jingan Branch Shanghai is a smoke-free property. A resort fee is included in the total price displayed. Only registered guests are allowed in the guestrooms. No pets and no service animals are allowed at this property. Construction is underway at a neighboring building and there may be noise disturbance from the construction work.